In Patna, the noisy capital of India's northern Bihar state, a crowd gathers early for the weekly janata darbar, the "people's audience." Many have traveled for hours, even days; some stop for a bit of fortification  sticky sweets and fried snacks from vendors on the lawns outside  before they enter the makeshift meeting hall. By 10:30 a.m. hundreds are standing under the whirring ceiling fans and corrugated metal sheeting. They form an impeccably ordered queue. Nearly all are men, most are poor, a few are barefoot, and each one has showed up for the same thing: to present their grievances directly to Bihar's chief minister, Nitish Kumar, the man at the end of the line. In a spotless white cotton tunic and pants, Kumar, 60, sits at a desk with a clear view of the only clock in the hall. The desk is bare except for a microphone and a pen, and Kumar glances briefly at each petition as it's placed before him. There are requests for jobs, complaints about corrupt village officials and pleas for a new bridge or ration shop. Kumar dispatches them to the row of ministers and bureaucrats lined up at tables on one side, as clerks briskly usher each supplicant to the relevant official. By 12:30 p.m., Kumar kicks off his sandals under the desk and relaxes  all 800 cases have been heard. Petitioner Ram Naresh Pandey, a 75-year-old farmer with forearms like tree branches, says that since 1990 his fields haven't had enough water because his neighbors upstream, of a different caste, diverted it from the main irrigation canal. He wants a side canal for his part of the village and makes his case to the minister for water resources, who promises to look into it. Pandey can check: his complaint has been scanned and numbered, and, with some help, he can go to the nearest town to track its progress online. Why did he make the 124-km journey to the janata darbar? "If not here, then where?" he says. "We now have hope." Hope once seemed unimaginable in Bihar. For decades the state was an Indian byword for poverty, violence and corruption. But that was before Kumar became chief minister in late 2005. In nearly 40 years in politics, Kumar has forged a reputation for quiet living and firm leadership ever since, as a bookish, idealistic engineering student, he joined a 1970s youth movement against corruption, unemployment and rising prices. Kumar's formula for good governance is based on straightforward, effective initiatives. He set up fast-track courts that convicted nearly 66,000 criminals  including three members of Parliament  and he bet big on roads, building some 33,000 km in five years. That combination of security and connectivity has spurred Bihar's economy to 11% average annual growth since 2006, second highest in India after Gujarat, the country's industrial powerhouse, and on par with states with much higher incomes, better infrastructure and more educated populations. Kumar is now targeting official corruption  work that is drawing national attention. Indians are engaged in a fervent debate over whether corruption is an unavoidable lubricant in the country's rush to prosperity. Kumar, who is often mentioned as a possible future Prime Minister, believes that justice need not be sacrificed to achieve growth, and that Bihar can show the way for the rest of India. "We're not starry-eyed about the challenges ahead," says Sam Sharpe, India head of the British government's aid agency DFID. 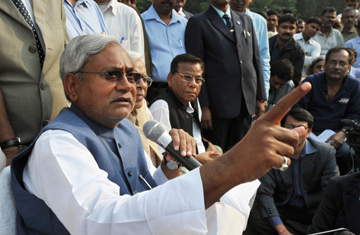 "But we do think what's happening [in Bihar] is quite a historic transformation." Read: "Real-Life Slumdog Millionaire: Man Wins Indian Game Show's Top Prize. See TIME's coverage on India.